Slice3r from http://slic3r.org/ converts 3D format as stl into machine, material and model specific G code. It can send the gcode directly to octoprint using the API key from octoprint as authentication. Adding supporting material when printing flatter than 45°. For supporting material infill rectangular can better be removed than honeycomb. The priorities of Slic3r are not in making a standalone gui program (however the gui is nice), it has a command line interface that allows to integrate Slic3r into other programs. 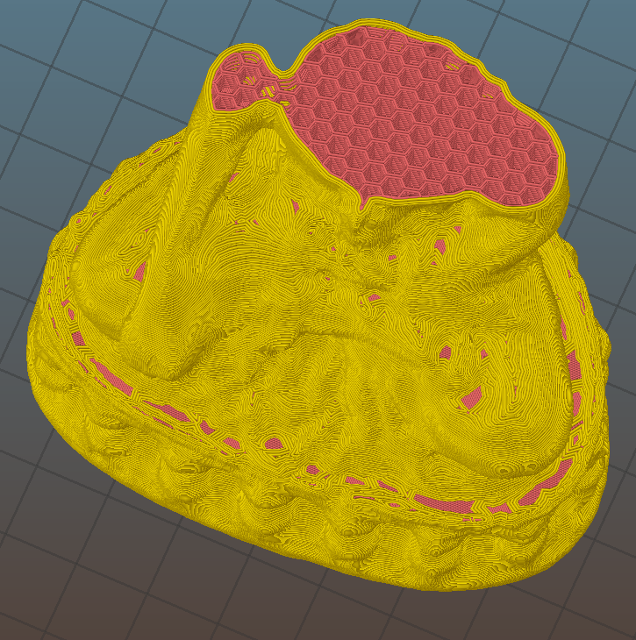 Having it standalone gives the better overview and link to its documentation to tune the many slice parameters. The configuration manager ask for the necessary settings to get a first useful printing result. Slic3r has two modes simple and expert. In simple modes all the settings supported via *.ini files that are ASCII readable. In expert mode the *.ini files parameters are split into 3: Print, Filament and Printer profiles. *.ini files can be still imported and exported. As tests with Velleman *.ini file import and export and diff showed, just in expert modes all parameters can be imported. In simple mode some are set to default. Therefore advanced users should work only in export mode to not get some of their settings set to default. The skirt is the outer ring that has the purpose to have the filament flow nicely before printing with the first and critical layer begins. The skirt does not touch the object. Perimeters are the outside walls of the objects. Top and bottom layers should get a concentric infill when the object is round. Brim is to make a larger surface on the bed so the object sticks better to it. It is attached to the object. Once printed, the surface can then be removed. Raft is an additional floor underneath the object to be printed (Brim is on the first layer(s) of the object). Mostly it is less dense and has a pattern. The extrusion width in % is based on the layer height and not the nozzle diameter. To achieve a good printing result, it has to be made sure that the values given result in an extrusion width that is larger than the nozzle diameter. As example if layer height is 0.2mm and extrusion width is 150% then the extrusion width is 0.2mm*150%=0.3mm and this is below the 0.35mm nozzle diameter.